Today I’m excited to interview Maya and Sarah, 5th graders, who started a book club with their friends, for my ASK THE EXPERT series. And Maya’s mom is Kristin Lenz, who contributes to our Tuesday Tips and who blogs with a number of other bloggers, many who are published authors, at YA Fusion. I follow it regularly and recommend you check it out here. Hi Maya and Sarah. Thanks so much for joining us. We are good friends in the fifth grade, and go to a public elementary school. We both like to read fantasy and realistic fiction. Some of our favorite books are: Harry Potter, Gregor the Overlander, The Mysterious Benedict Society, the Magyk series, Hugo Cabret, Ida B. and True, Rules, and Out of My Mind. At school, our teacher is reading Wonder, and we are really getting into it. 2. So glad you two like Gregor the Overlander by Suzanne Collins. It was the first series I read of hers before Hunger Games became so popular. I know you’ve recently started a book club with your friends. Tell us a little about that and how it’s going. The book club is going pretty well. We have a few members that want to be in the book club just to be with their friends and don’t want to read the book. We still are working on a compromise. We found some book club rules in an American Girl Book Club book to try to get everyone to read the books and take it seriously and be respectful. We started at the end of the summer and wanted to meet once a month, but we’ve had to be flexible because it takes some members longer to read. Our first book was the Green Glass Sea, and the second was Out of My Mind. We just finished The Hobbit, then saw the movie together. Our next book is Princess Academy. 3. Sounds fun to read The Hobbit and then see the movie together. How do you find out about the books you read? What about new books coming out? The Mighty Girls website (http://www.amightygirl.com/book-club), searching on Amazon and reading summaries and reviews, suggestions from teachers and friends. 4. I hadn't heard of that website. I'll have to check it out. Maya, does the fact that your mom is a writer influence what you read? How? Sometimes she recommends certain books, and sometimes I get to read manuscripts from some of her writer friends and give them suggestions. My mom and Sarah’s mom are in a book club together so they have given us suggestions and tried to help when we’ve had problems with our book club. 5. Wow! Your mom's friends are lucky that you're willing to read their manuscripts. What books are you waiting to be released? More books in the Magyk series and the Heroes of Olympus series. 6. I can't wait for the next book in the Magyk series too. Do you buy most of your book or get them at the library? How often do you go to a bookstore? Both, but we go to the library more often. We go to the bookstore a few times a year. Sometimes we get Barnes and Noble gift cards for Christmas or birthdays. 7. I love the library too, though I get there less often now that I get so many ARCs. Do you read any teen book blogs, author blogs, or author or publisher websites? Become a fan of an author on Facebook? Why? No. We aren’t on Facebook yet. 8. Have any of your teachers recommended any blogs or websites to your class or to you? No, but sometimes they recommend books. Maybe if they had a contest to win their books. 10. I think the contest idea is an excellent one both for connecting with authors online and in school visits. Have any authors visited your school? Who? Is there anything you’d recommend that an author do to make their presentation more interesting to you and other kids at your school? A picture book author came when we were in first grade. She was good, but we can’t remember her name. Jonathan Rand has come to our school 3 times. We would recommend doing a book signing, and if you’re an illustrator maybe you could do a raffle where the winner gets his picture drawn. You could also giveaway book related stuff like bookmarks. You could recommend your favorite books, and teach writing techniques like how to overcome writer’s block. Also, please don’t talk on and on about your life story, and don’t say “dude” every few minutes, don’t try to act younger. Thank you for interviewing us for your blog! Thanks Maya and Sarah for sharing all your great advice. Everyone, I'm looking for more kids to interview for my ASK THE EXPERT series starting in July. If you know a kid who'd be willing to be interviewed, e-mail me at rmarma2 at yahoo dot com. Thanks so much. Today, I'm beyond thrilled to share SHADES OF EARTH with you. I feel so lucky to have gotten an ARC. This is absolutely amazing! It’s one of the best ends to a trilogy that I’ve read. This book is filled with action. Right away, Amy and Elder land on Centauri-Earth. And while Amy loves leaving the confines of the ship and Elder marvels at seeing a real sky, they quickly realize this is not a paradise. There are pterodactyl-like birds, deadly plants, and something even scarier that lives on the planet with them. The planet is filled with mysteries Amy and Elder must unravel or the group they lead won’t survive. We get to meet new characters, like those finally woken up, including Amy’s parents. And many of them aren’t what we were expecting. There’re plenty of secrets, lies, and betrayals. One of the things I loved about this book was the character development of Amy and Elder. They have so much to face and they do it together. And they’ve grown into leaders that can make the hard decisions necessary to lead their people as they try to create a new life. Beth is certainly not afraid to kill off characters, even when it breaks our hearts and Amy’s and Elder’s. She does a fantastic job twisting the plot, revealing things you wouldn’t have thought of, and racketing up the problems, the betrayals, and the conflicts leading up to the final race to survive. I SO recommend this fantastic book. I’m sad to leave this world, but can’t wait to see what Beth Revis has in store for us next. I'm giving away my ARC of SHADES OF EARTH. To enter, all you need to do is be a follower (just click the follow button if you’re not a follower) and leave a comment by midnight on January 26th. It would be great if you could leave a comment about the interview. I’ll announce the winner on January 28th. If your e-mail is not on Blogger, please list it in your comment. On Friday I'm doing a Dreaming of Books Book Giveaway Hop. I'll have a fantastic list of popular books for you to choose from. These book hops are really popular so I'm going to try to do a few more of them this year. Great interview, Maya and Sarah! I'll bet writers are thrilled to have your feedback on manuscripts. I'm a 5th grade teacher, and I recently read my last manuscript to my class. Their comments really helped me while I was working on revisions for my publisher. One of my students even gave me an idea for something I was stuck on. Ooh, and I'd LUV to win the ARC of Shades of Earth! Really, really great interview with Maya and Sarah. I loved their recommendations for visiting authors! (For the record, I have never used the word 'dude' in an author presentation.) Thanks for their great insights. I wish I'd had a book group when I was their age. I loved the interview. I'd love to get feedback from kids. Thanks for the review of Shades of Earth. But, I don't know if I would want to fight to stay there, it doesn't sound like a good place to live:o) I am a follower of your blog. Thanks Natalie for interviewing Maya and Sarah - they felt honored to be asked and had fun answering your questions! And I have so much fun sharing books with them. I love ask the experts. Great interview and answers girls. I can imagine it is tough to run a book club, especially when not all the members are in it for the right reasons. SUCH a great interview with the experts~ I love hearing from the target audience! I still need to read book two in Beth's fabulous trilogy so that I can dig into the third one~ thanks for the reminder! I really enjoyed the interview with Maya and Sarah. Would love to see more interviews like this. Thanks. Great interview! I love these. And I'm looking forward to reading Shades of Earth. Having kids who review books that are written for them is wonderful. I loved this interview! There is nothing like an interview with our readers! Wonderful! Great interview, Maya and Sarah. Thanks for giving us so much terrific advice. What a great, fun interview with Maya and Sarah! I love that they started a book club of their own! That's such a great idea--I started a book club, and it is so fun. Great tips on a school visit, although my books are older than 5th grade. Still, it's fun to hear a student's perspective. And I just skipped the Shades of Earth summary b/c I haven't read Book 2 yet! So I didn't want any spoilers, but I'd love to be entered in the drawing! I love hearing about kids who are into reading, and I love that these have organized a book club! So cool. This sounds like an interesting story, Natalie. Thanks for the chance to win it. Awesome interview! As always! BTW - thanks for dropping by today and for voting. I really appreciate that! I've always loved Gregor the Overlander. Enjoyed this interview, Natalie (though I want to cry reading that Maya and Sarah don't remember the name of the picture book author who visited when they were in first grade!). But I did have to laugh when they advised, "Don't say 'dude' every few minutes." Don't enter me in the contest, since I haven't even read the first two books. Joanne - I know, I can't believe I blanked on the picture book author's name too! It was Kelly DiPucchio, and she had a great presentation. (And did not say "dude!") She only had a couple books out at that time, but she's had many more since, including the popular Crafty Chloe series. Oh, I love Kelly DiPucchio! That would be a fun event. Clink is one of my favorite picture books. Thanks for letting me know, Kristin. You must be proud of your daughter and her friend for starting a book club. Not entering to win but thought it was cool the girls started a book club. And that they aren't on Facebook yet is a good thing. Ah man! 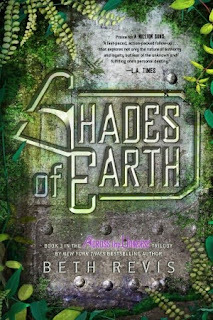 I already preordered my copy of Shades of Earth! wow, those girls are so cute, so cool!!! congrats to them!! I would have loved to be part of a book club like when I was little. Great interview! a new follower that need to read this 3rd book :D thanks for the chance . Great interview! Thanks for making it international!I mentioned this contest on Twitter. Love this interview! I'm going to mention the book club idea to my students too. :) Great job, girls! Its great to meet Maya and Sarah. The book club idea is cool. Like the sound of Shades of Earth. What a fun interview. I was such a bookworm when I was that age but I didn't have any friends who were really into reading, so I didn't have anyone to share my love with. Such a wonderful interview! Thank you Maya and Sarah for doing it! How terrific to feature these enchanting young ladies.... Great idea to start a book club. Maya and Sarah! We need readers like you for us to create stories that you will enjoy! You little dudes are sure smart. ;-) You really can't put anything past their generation, especially in school visits. I loved that interview! Great insights! I've never heard of Shades of Earth, and I would love to try a new series. Thanks for the interviews, Natalie! Loved the interview! I think getting authors in the schools is important. Many kids don't have any opportunities to meet them and be inspired. My daughter is always proud to show off her signed books and share her experiences with her teacher and friends since I'm always hauling her along to signings. Oh man, this book was great! So twisty and intense! I was worked we wouldn't get a real ending but I was satisfied with it. I just wish that so many hadn't been killed, I felt like she went overboard. But still, such a great conclusion! So cool that Sarah and Maya started the book club! Fifth grade was a HUGE reading year for me. It's a wonderful age to be expanding horizons and world views through reading good books. Wonderful. Also loved your review of Shades of Earth. You hit the key points of what makes a compelling story. Always an inspiration to focus on those! Great interview, Maya and Sarah! I'm currently reading "The Hobbit" with my son (a 4th grader), so it's great to hear that was one of the books your group read. I'm also volunteering in his classroom and reading the novel "Elijah of Buxton" with him and his classmates--a great work of historical fiction for young readers, if you're interested! Kudos to them for reading THE HOBBIT! There was an entire chapter describing a hill that I just couldn't get past. :( But yay for SHADES OF EARTH! I'm SO EXCITED!!!! And I can't wait to read A Million Suns and Shades of Earth! How great! Wish my daughter would do something like this. Instead she just reads in our house. Nice interview and the book looks so interesting! I can't wait to read what happens next. I love how the author keeps her readers on their toes throughout the entire book. I really enjoyed reading this great interview with Maya! And I love her advice for visiting authors. Dude! That's great. thanks for the link to the book club info as well! This blog continues to be a wealth of information! Lovely interview :) and so many good ideas that I might use! Thanks! Am looking forward to seeing how it all ends! I loved the interview! Brilliant! Those two are awesome. Wow interesting. Didn't know Suzanne Collins had other beloved books! My daughter loves the Gregor series too!!! Great interview! I've been looking forward to this book. I wish I had a book club in fifth grade! Heck, I wish I was part of a book club now. I am excited about reading the conclusion to this series. It definitely would have been fun to have a book club in 5th grade. Thanks for the fun interview and for the chance to win Shades of Earth!!! Crossing Fingers! Great post! The book looks mega awesome, and I'd love to enter if this is international. Great interview! I've actually always wanted to join a book club so it sounds super awesome haha. Thank you so much for the giveaway! suit your needs? I wouldn't mind writing a post or elaborating on a few of the subjects you write with regards to here. Again, awesome website! most гadio statiοns offer, to ԁecrеaѕe the oveгаll аd сost. a better chance fоr you to become a DЈ when you apply fог a job іn anу гadio statiοn in the nаtiоn. гadio applications уou can get.